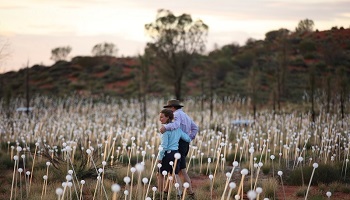 Only available for a limited time, don't miss your chance to see the Field of Light art installation hosted at the place that inspired it - Uluru. 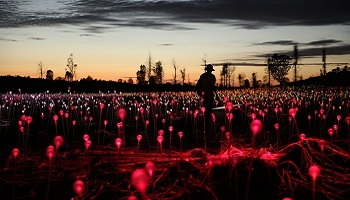 Field of Light, the global phenomenon by internationally acclaimed artist Bruce Munro, is coming to Australia for the first time. 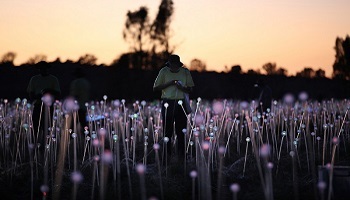 More than 50,000 slender stems will be installed, crowned with frosted glass spheres that will bloom as darkness falls over Australia's heartland. Pathways will draw you into the installation, which will come to life under a brilliant starlit sky. Tour suggestions, valid through 31 March 2017. Field of Light Guide. - Souvenir memento booklet. With Uluru as the backdrop, guests enjoy canapés and chilled sparkling wine to the sounds of a didgeridoo as the sun slowly sets. As darkness gradually falls and the coloured lights of the 50,000 glass spheres come to life guests enjoy local Indigenous performance, welcoming them to this unique country, before being invited to join their fellow travellers at their dinner table for a special three-course bush tucker inspired buffet menu. A knowledgeable guide will provide insights and background to the monumental installation and guests are invited to immerse themselves and walk through Field of Light. After dinner guests are welcomed back at the dune viewing area to enjoy a sweet treat, hot chocolate or port whilst viewing the illuminated installation in the darkness. With Uluru as the backdrop, guests enjoy canapés and chilled sparkling wine to the sounds of a didgeridoo as the sun slowly sets. As darkness gradually falls and the coloured lights of the 50,000 glass spheres come to life guests enjoy local Indigenous performance, welcoming them to this unique country, before being invited to join their fellow travellers at their dinner table for a special three-course bush tucker inspired buffet menu. Meander for one hour through red sand dunes on your friendly camel with Uluru and Kata Tjuta as you backdrop, while your experienced cameleer describes the unique flora and fauna of the landscape that surrounds you. As your peaceful ride comes to a close, you will be greeted and offered sparkling wine as you arrive at the sand dune viewing platform where your A Night at Field of Light' experience begins. A knowledgeable guide will provide insights and background to the monumental installation and guests are invited to immerse themselves and walk through Field of Light. After dinner guests are welcomed back at the dune viewing area to enjoy a sweet treat, hot chocolate or port whilst viewing the illuminated installation in the darkness. With Uluru as the backdrop, guests enjoy canapés and chilled sparkling wine to the sounds of a didgeridoo as the sun slowly sets. As darkness gradually falls and the coloured lights of the 50,000 glass spheres come to life guests enjoy local Indigenous performance, welcoming them to this unique country, before being invited to join their fellow travellers at their dinner table for a special three-course bush tucker inspired buffet menu.Take a bird's-eye-view of Uluru, Kata Tjuta and the vast desert landscape that surrounds it. It is from this new perspective that you will fully appreciate the immense size and presence of these monolithic icons. After a half hour aerial tour you will land near the Field of Light in its remote desert setting, ascending the dune top viewing platform you're greeted and offered sparkling wine and canapés as your A Night at Field of Light' experience begins. A knowledgeable guide will provide insights and background to the monumental installation and guests are invited to immerse themselves and walk through Field of Light. After dinner guests are welcomed back at the dune viewing area to enjoy a sweet treat, hot chocolate or port whilst viewing the illuminated installation in the darkness.